I love a good Third Reich documentary as much as the next WWII obsessive, but there does come a point during one’s third or fourth sitting of Ovation’s Stalingrad series or 1945: The Year That Changed the World where one comes to a single conclusion; namely that there’s only so much black and white footage a man can take. 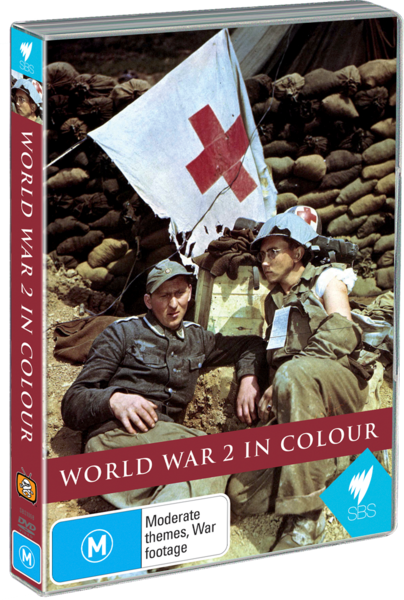 Enter World War 2 in Colour, a decade-old and still largely unsurpassed SBS compendium of some of the most immediate, arresting and worthwhile of the surviving colour footage from the period. Much of the material was once thought lost; some captured German films turned up in Moscow near the turn of the century, other Nazi propaganda films gathered dust in state archives for several decades before being discovered. The film is comprised of two chapters. ‘Blitzkrieg’ documents the Nazi rise to power and its dominance over Western Europe during the early years of the war. ‘Triumph and Tragedy’, as the title suggests, focuses on the German losses in Russia, the eventual American defeat of the Japanese and the great number of casualties suffered by all the armed forces involved in the greatest mass conflict humanity had ever known. The compilation also includes the filmed reminiscences of Wehrmacht soldiers at the Eastern front, Allied and National Socialist propaganda films, footage of Nazi rallies, candid shots of Hitler taken by an uncredited Eva Braun, period newsreels and the work of American auteurs such as William Wyler and John Ford, who won an Academy Award for his coverage of the 1942 Battle of Midway. As a compendium of colour footage the film is by no means complete or authoritative, and though the narration is generally excellent certain of its assertions may also be disputed. It is however an excellent introduction to some of the best colour footage of the period, and a great starting point for those wishing to delve into the topic in more detail. Much of the material, such as footage of a Japanese kamikaze crashing his plane into a US warship or amateur shots of the German war injured carry a resonance and poignancy that is magnified by the fact they are presented in colour. It’s a moving and important collection as well as a forceful reminder of all that’s great, and ignoble, about the human race. The film is presented in a 4:3 aspect ratio that fills out nicely on a widescreen presentation without coming across too stretched or boxy. The English 2.0 soundtrack is fairly standard but up to narrative requirements nonetheless; no audio dropout or faults to speak of.